PROPERTY REF: BLISS-129 Agency Fees included (4.5%) Fees payable by vendor. This vast property sits on the edge of an old Gascon village in the heart of the Gers, with mature and carefully tended gardens with an attractive heated pool facing the south towards the Pyrenees, with far reaching views. The non-isolated location of this property on the edge of a village offers a sense of security, and yet utter tranquility is ensured by the parkland surrounding the house. There is an immediate impression of elegance on arrival to the property from the parkland, pathways, impressive old stone well, and stone walls. 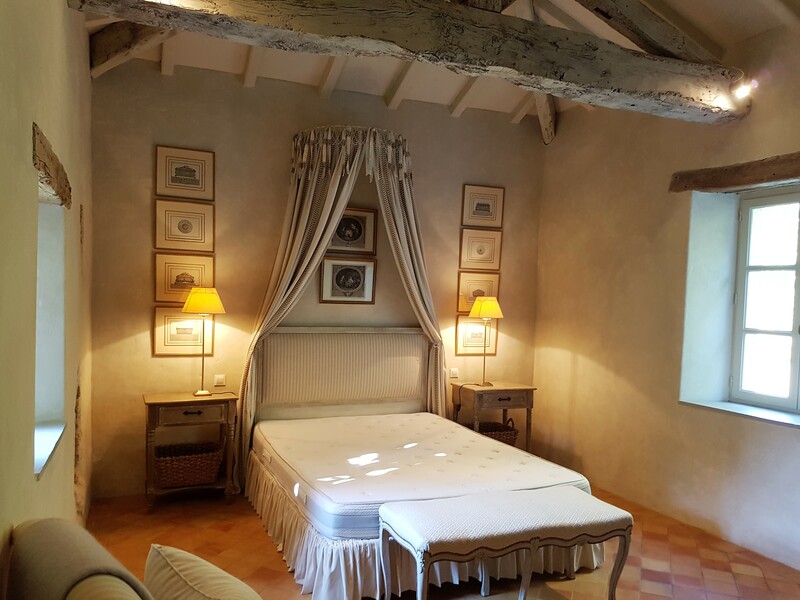 Extensive restorations have been carried out by the current owner in the last few years, lending a contemporary touch to the property in parts, whereas in others the original feel of the old stone house is still in evidence. Period features (such as the old stone walls and open fireplaces) have been retained, though blended with the comfort of newly fitted bathrooms and kitchen. A separate contemporary house has been seamlessly incorporated into the “ensemble”, and in recent years an open barn extension with feature stone walls (which once provided a shaded eating area) has been converted into a fabulous contemporary veranda, creating a spacious room filled with light, with views to the pool and gardens, with a private terrace which offers an intimate space for dining. The property can be used as a whole, as it has been designed so that each section flows into the next, or compartmentalized, to provide a comfortable family home and separate guest wing. This is a property which can easily sleep twenty guests or more in its entirety. Equally, the current owners live in the main section of the property, with its spacious and contemporary kitchen, sitting room with open fireplace, dining room, and light-filled veranda, using the additional space when their children and grandchildren visit. The property is light, bright and spacious, offering multiple possibilities for a large family, or for a business activity. This is a desirable location for guests with access to Saint Clar, Fleurance, Lectoure, Agen (with its new fast TGV line to Paris) or Toulouse international airport. The property benefits from a garage, ample outdoor parking space, as well the impeccable lawns where it is possible to keep one’s hand in at golf, or to play tennis. It is unusual to find such a spacious property. It is not beyond the realms of possibility to imagine two families sharing this property, or the development of a lucrative chambre d’hôte activity, with the addition of evening meals increasing revenue potential. The current owners like to travel and have also found that there has been a significant demand, at the upper end of the rentals market, for the location of the entire property for weddings, or other company events. The possibilities are endless. This is a property which is ‘ready to go’ as a business, or as a home. The current owner has taken care of the restoration of the building, and the new owners can move in and open doors to clients on day one. Here at BLISS we particularly like: The extensive and elegant gardens, with the fabulous poolside area, looking out towards the Pyrenees, which are clearly visible on some days. We also adore the light filled “glass” reception room, overlooking the gardens. Even in the depths of winter this room is filled with light, and it is a wonderful space to entertain, or spend an afternoon reading. The owner has cleverly incorporated the original stone wall of the house, so that there is an aesthetically pleasing mélange of glass and stone. We also appreciate how easily one could develop a lucrative business in this property, in an area which continues to attract tourists from all over the world.